Vital Dental Care opened our state-of-the-art Camp Hill family dentist office in the Spring of 2016. Our facility may be new but Dr Philip Chou (Dentist) has over a decade of experience as a family dentist in the bayside of Brisbane. Until presented with the opportunity to open his own facility, Dr Chou practiced in the same location ever since graduating from dental school — something that isn’t very common these days! At Vital Dental Care, we value our patients trust. We listen to their concerns and will formulate a treatment plan that is achievable, affordable and optimal. It can be exceptionally challenging to fit dental care in before work or school, in the evenings or on Saturdays. At Vital Dental Care, we provide extended and weekend hours so that you don’t have to alter your busy routine to get the care that your family deserves. It is important to us that we provide each of our patients with the best quality of dental care, creating a positive dental experience to ensure our patients return to maintain their healthy smiles. If you feel uneasy about visiting the dentist, rest assured that we understand. Growing up, Dr Chou was not fond of the experience, himself! His empathy for you and your children enables him to ensure the most relaxing care experience possible. Our modern facility was designed with advanced oral health care in mind. We’re equipped to provide comprehensive dentistry for patients of all ages, including services like Invisalign® braces and sleep apnoea appliances, with more to come. With free parking, public transport and disability access, it’s easy for you to get in and out without missing work. Saturday appointments are available and insurance plans are gladly accepted. 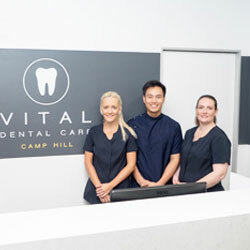 Contact Vital Dental Care in Camp Hill today to book your new patient appointment.